I love the little short stories/novellas/gift books that come out. I always enjoy grabbing a quick read that I can enjoy by the fire on a yucky day! As a reviewer though I get to enjoy these books in September and October – but that is okay with me too!! What would you do if all that you thought you knew about your life was revealed to be not what you thought? How would you find the strength to stand against all those who know you when someone you love makes a choice that threatens your reputation and their own? Those are just two of the issues faces in my latest read. 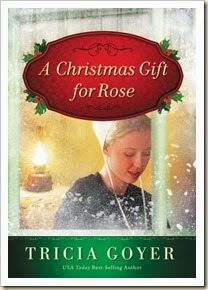 A Christmas Gift for Rose, written by Tricia Goyer, is a sweet Amish story that takes place right after World War II. Rose is engaged to a man who choses to face what he feels God is calling him to do rather than opt out. Most Amish men choose prison over the military, they are a people group who believe strongly in pacifism. However, Jonathan felt that he would honor God more with his service to help soldiers who were injured and served as a medic. His people do not understand or forgive his choices though. Meanwhile, Rose continues to have nightmares that terrify her. Finally her mother reveals the truth to Rose’s past, that she was not born into that family. So Rose must figure out who she is, and what she will stand for. This story takes place between Thanksgiving and Christmas and is a sweet story. There are many things to catch in this story – my favorite is the value of family. You will chuckle, you might cry, but in the end it will warm your soul! kind—Englischers? When the man she loves leaves her behind, Rose is certain he left for good. Yet Rose discovers sometimes our greatest gifts are the ones we fear. About Tricia: USA Today best-selling author Tricia Goyer is the author of over 35 books, including the three-book Seven Brides for Seven Bachelors series and “Lead Your Family Like Jesus,” (co-written with Ken Blanchard). She has written over 500 articles for national publications and blogs for high traffic sites like TheBetterMom.com and MomLifeToday.com. She is the host of Living Inspired, a weekly radio show. Tricia and family live in Little Rock, Arkansas. They have six children. NOTE : I received a copy of A Christmas Gift for Rose in exchange for an honest review, by Zondervan Publishers.